JENNY and Mr. Wren were busy. If there were any busier little folks anywhere Peter Rabbit couldn't imagine who they could be. You see, everyone of those seven eggs in the Wren nest had hatched, and seven mouths are a lot to feed, especially when every morsel of food must be hunted for and carried from a distance. There was little time for gossip now. Just as soon as it was light enough to see Jenny and Mr. Wren began feeding those always hungry babies, and they kept at it with hardly time for an occasional mouthful themselves, until the Black Shadows came creeping out from the Purple Hills. Wren babies, like all other bird babies, grow very fast, and that means that each one of them must have a great deal of food every day. Each one of them often ate its own weight in food in a day and all their food had to be hunted for and when found carried back and put into the gaping little mouths. Hardly would Jenny Wren disappear in the little round doorway of her home with a caterpillar in her bill than she would hop out again, and Mr. Wren would take her place with a spider or a fly and then hurry away for something more. Peter tried to keep count of the number of times they came and went but soon gave it up as a bad job. He began to wonder where all the worms and bugs and spiders came from, and gradually he came to have a great deal of respect for eyes sharp enough to find them so quickly. Needless to say Jenny was shorter-tempered than ever. She had no time to gossip and said so most emphatically. So at last Peter gave up the idea of trying to find out from her certain things he wanted to know, and hopped off to look for some one who was less busy. He had gone but a short distance when his attention was caught by a song so sweet and so full of little trills that he first stopped to listen, then went to look for the singer. It didn't take long to find him, for he was sitting on the very tiptop of a fir-tree in Farmer Brown's yard. Peter didn't dare go over there, for already it was broad daylight, and he had about made up his mind that he would have to content himself with just listening to that sweet singer when the latter flew over in the Old Orchard and alighted just over Peter's head. "Hello, Peter!" he cried. "Hello, Linnet!" cried Peter. "I was wondering who it could be who was singing like that. I ought to have known, but you see it's so long since I've heard you sing that I couldn't just remember your song. I'm so glad you came over here for I'm just dying to talk to somebody." Linnet the Purple Finch, for this is who it was, laughed right out. "I see you're still the same old Peter," said he. "I suppose you're just as full of curiosity as ever and just as full of questions. Well, here I am, so what shall we talk about?" "You," replied Peter bluntly. "Lately I've found out so many surprising things about my feathered friends that I want to know more. I'm trying to get it straight in my head who is related to who, and I've found out some things which have begun to make me feel that I know very little about my feathered neighbors. It's getting so that I don't dare to even guess who a person's relatives are. If you please, Linnet, what family do you belong to?" Linnet flew down a little nearer to Peter. "Look me over, Peter," said he with twinkling eyes. "Look me over and see if you can't tell for yourself." Peter stared solemnly at Linnet. He saw a bird of Sparrow size most of whose body was a rose-red, brightest on the head, darkest on the back, and palest on the breast. Underneath he was whitish. His wings and tail were brownish, the outer parts of the feathers edged with rose-red. His bill was short and stout. Before Peter could reply, Mrs. Linnet appeared. There wasn't so much as a touch of that beautiful rose-red about her. Her grayish-brown back was streaked with black, and her white breast and sides were spotted and streaked with brown. If Peter hadn't seen her with Linnet he certainly would have taken her for a Sparrow. She looked so much like one that he ventured to say, "I guess you belong to the Sparrow family." "That's pretty close, Peter. That's pretty close," declared Linnet. "We belong to the Finch branch of the family, which makes the sparrows own cousins to us. Folks may get Mrs. Linnet mixed with some of our Sparrow cousins, but they never can mistake me. There isn't anybody else my size with a rose-red coat like mine. If you can't remember my song, which you ought to, because there is no other song quite like it, you can always tell me by the color of my coat. Hello! Here comes Cousin Chicoree. Did you ever see a happier fellow than he is? I'll venture to say that he has been having such a good time that he hasn't even yet thought of building a nest, and here half the people of the Old Orchard have grown families. I've a nest and eggs myself, but that madcap is just roaming about having a good time. Isn't that so, Chicoree?" "Isn't what so?" demanded Chicoree the Goldfinch, perching very near to where Linnet was sitting. "Isn't it true that you haven't even begun thinking about a nest?" demanded Linnet. Chicoree flew down in the grass almost under Peter's nose and began to pull apart a dandelion which had gone to seed. He snipped the seeds from the soft down to which they were attached and didn't say a word till he was quite through. Then he flew up in the tree near Linnet, and while he dressed his feathers, answered Linnet's question. "It's quite true, but what of it?" said he. "There's time enough to think about nest-building and household cares later. Mrs. Goldfinch and I will begin to think about them about the first of July. Meanwhile we are making the most of this beautiful season to roam about and have a good time. For one thing we like thistledown to line our nest, and there isn't any thistledown yet. Then, there is no sense in raising a family until there is plenty of the right kind of food, and you know we Goldfinches live mostly on seeds. I'll venture to say that we are the greatest seed-eaters anywhere around. Of course when the babies are small they have to have soft food, but one can find plenty of worms and bugs any time during the summer. Just as soon as the children are big enough to hunt their own food they need seeds, so there is no sense in trying to raise a family until there are plenty of seeds for them when needed. Meanwhile we are having a good time. How do you like my summer suit, Peter?" "It's beautiful," cried Peter. "I wouldn't know you for the same bird I see so often in the late fall and sometimes in the winter. I don't know of anybody who makes a more complete change. That black cap certainly is very smart and becoming." Chicoree cocked his head on one side, the better to show off that black cap. The rest of his head and his whole body were bright yellow. His wings were black with two white bars on each. His tail also was black, with some white on it. In size he was a little smaller than Linnet and altogether one of the smartest appearing of all the little people who wear feathers. It was a joy just to look at him. 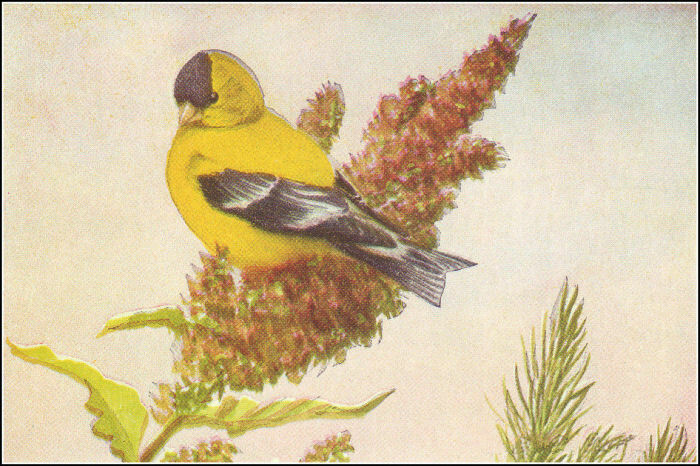 If Peter had known anything about Canaries, which of course he didn't, because Canaries are always kept in cages, he would have understood why Chicoree the Goldfinch is often called the Wild Canary. There is no mistaking this little yellow and black bird. Mrs. Goldfinch now joined her handsome mate and it was plain to see that she admired him quite as much as did Peter. Her wings and tail were much like his but were more brownish than black. She wore no cap it all and her back and head were a grayish-brown with an olive tinge. Underneath she was lighter, with a tinge of yellow. All together she was a very modestly dressed small person. As Peter recalled Chicoree's winter suit, it was very much like that now worn by Mrs. Goldfinch, save that his wings and tail were as they now appeared. All the time Chicoree kept up a continual happy twittering, breaking out every few moments into song. It was clear that he was fairly bubbling over with joy. "I suppose," said Peter, "it sounds foolish of me to ask if you are a member of the same family as Linnet." "Very foolish, Peter. Very foolish," laughed Chicoree. "Isn't my name Goldfinch, and isn't his name Purple Finch? We belong to the same family and a mighty fine family it is. Now I must go over to the Old Pasture to see how the thistles are coming on." Away he flew calling, "Chic-o-ree, per-chic-o-ree, chic-o-ree!" Mrs. Goldfinch followed. As they flew, they rose and fell in the air in very much the same way that Yellow Wing the Flicker does. "I'd know them just by that, even if Chicoree didn't keep calling his own name," thought Peter. "It's funny how they often stay around all winter yet are among the last of all the birds to set up housekeeping. As I once said to Jenny Wren, birds certainly are funny creatures." "Tut, tut, tut, tut, tut! It's no such thing, Peter Rabbit. It's no such thing," scolded Jenny Wren as she flew last Peter on her way to hunt for another worm for her hungry babies.